When we were on the Great Ocean Road in Victoria, we drove for quite a while and past a place called Kennett River. We saw a tourist bus on the side of the road. When we went a little further, we saw other cars and people pointing up into the trees. So then we all looked up and one of us saw a koala. So, we stopped the car and we looked for the koalas too. We saw about 14 koalas in the trees. 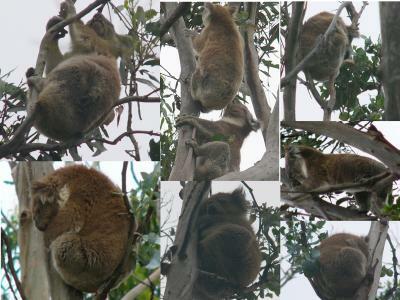 Some of the koalas were sleeping. Mum and Reuben saw two that were fighting, but we didn't know what they were fighting about. Maybe they were fighting about their territory. Some of the koalas looked like they were waving. The trees were quite bare in that area because the koalas had eaten most of the leaves on them. WOW that is awesome, you are so lucky to see koalas in the wild, I can't do that cause I live in United States, but I heard it is really hard to see Koalas in the wild. That is really cool.